Try something different on St Patrick’s Day with a cheeky Chocolate Guinness Cocktail, brought to you by Congress Centre, one of the leading conference and events venues in central London. Lightly crush two cardamom pods in the bottom of a large high ball glass. 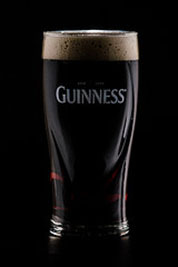 Add 35ml vodka & 25ml of Crème de Mûre to the glass, then top up with half a can (235ml) of Guinness Draught and stir. Float chocolate ice cream on the drink and garnish with a sprinkle of nutmeg.